Let's hear it for the "Junk Yard Dog" himself, Otis Wilson. In 1985, the year all Bear fans remember, we had Richard Dent, Mike Singletary, Dan Hampton, and the Fridge, in no particular order. The unbelievable Bears defense probably didn't reach its peak until fireball Wilbur Marshall hit the starting lineup. Before most of the glorified '85 defense, however, was the original Junk Yard Dog, Otis Wilson. Otis Wilson was picked in the first round of the 1980 draft by the Bears from Louisville. 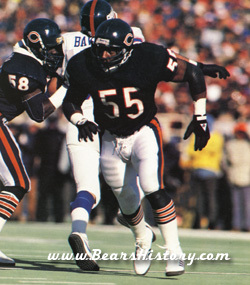 A year ahead of future (current) Hall of Famer Mike Singletary, regardless, Wilson played as much a part of the dominating Bear defenses of the mid-eighties as any other defensive player did. As much as Wilson was a part of the '84, '85 and '86 defenses, however, this bright star faded away much quicker than he should have. Wilson was a solid, fast outside linebacker whose skills improved with the addition of the streaking Marshall and the solidity of the steadily improving Singletary. According to records, Wilson progressed slowly, as the "46" defense did in NFL lore. Wilson's first official sacks came in 1982, when he finished with 2.5. In 1983, he amassed 2. In 1984, the year the team set an NFL record with 72 QB takedowns (that still stands in 2001), Wilson compiled 6.5. '84 was the year he began to stand out. With Al Harris manning the other bookend linebacker spot, the Bears became almost impossible to run or pass upon. And then there was 1985. Who can mistake the images of one Otis Wilson throwing down opposing quarterbacks and celebrating around their lifeless corpse. Against New England (in the regular season), Detroit, and Dallas, the original "Junk Yard Dog" could be seen nailing the opposing QB with only a laugh at the end to punctuate the ease with which this defense could inflict pain upon opposing teams. Against Minnesota at Soldier Field, Otis grabbed one of five interceptions on the day and took it in for a score. Against Dallas, in a 44-0 blowout, he took out the frustrations of a city without a championship for 23 years on "America's Team" by dragging around their quarterbacks by their jerseys for the day. Wilson amassed ten and a half sacks that year, and probably created the "Junk Yard Dogs" persona. By the end of the year, he had the entire linebacker corps, then the entire defense, then the entire City of Chicago, chanting "Woof, Woof, Woof, which would resonate in the stands of So ldier Field for the next decade. Wilson played a major role in the 46-10 Super Bowl victory as well, contributing on a defense that set many Super Bowl records in shutting down the New England offense. 1985 would prove to be Wilson's Swan Song, most aptly summarized by his lyrics from the "Super Bowl Shuffle: "I'm mama's boy Otis, one of a kind. The ladies all love me For my body and my mind. I'm slick on the floor as I can be But ain't no sucker gonna get past me. Some guys are jealous Of my style and class, That's why some end up on their ---, I didn't come here lookin' for trouble, I just get down to The Super Bowl Shuffle." As much as he was an awesome Linebacker, he was an irreplaceable character on a cast that will never be re-created, the 1985 Bears, Sadly, Wilson's pro career faded after the 1987 season. He was a contributing factor to the record-setting 1986 Bears defense. In 1987, he injured his knee, and fell out of favor with Mike Ditka during the player's strike. He was cut in 1988 after eight stellar years with the Bears, and played one more undistinguished year with the Los Angeles Raiders. Given that the Bears were sorely lacking at the linebacker position in their last championship-game run in 1988, who knows what might have happened if they still had #55 terrorizing opposing offenses for one or two more years. Wilson was drafted in the first round from Louisville in 1980, the year following legendary Doug Buffone's retirement. He was virtually unblockable during his peak from 1984-1987. Then again, playing behind the league's best defensive line and with the greatest other pair of linebackers in the NFL didn't hurt. Wilson and Head Coach Mike Ditka had a publicized battle at the end of the 1987 season. Ditka predicted that Wilson was finished. He then missed the 1988 season with a knee injury, then finished 1989 with the Los Angeles Raiders.